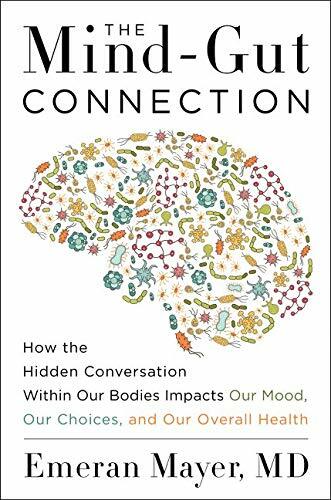 There is plenty of evidence for the premise of Emeran Mayer's book, that the gut has close connections with our moods and even our cognitive processing. There has been a great deal of scientific work in this area in the last decades, and it turns out that some emotional problems can be helped by changes in eating patterns. Mayer provides plenty of surprising facts, such as that 95% of the body's serotonin is stored in the gut. The gut and the brain are constantly signaling to each other. It has long been known that stress can give us digestive problems, and depression can affect appetite. It is often thought that what you eat can affect your mood, from aphrodisiacs to calming teas. Mayer goes beyond these sorts of observations and explain how the gut has an intelligence of its own in identifying what kind of food is coming to it and preparing to digest it. He show how complex an environment it is, and how many animals share similar complexities. He says that when he has patients with mind-gut disorders, they are often confused and alarmed about what their problem is, and often it is calming just to explain how those connections work. But of course that is a very indirect form of intervention and people can't directly control their guts. Most of the sensory information gained by the gut is not even in consciousness, even though the gut has some of the sensory processes in are in the mouth and are involved in taste. While the science of the gut and its connection to the mind are very promising avenues of research, it is also true that there are plenty of supposed remedies that are ineffective or are unproven. Many diets or foods are claimed to have great effects on energy, concentration, mood, or more physical attributes. Mayer's expertise is in the treatment of rather rare disorders and he gives plenty of examples of these. He goes into all sorts of science such as the influence of early trauma on digestion and how mothers pass on their microbes to their children in childbirth and breast feeding. He also gives examples of studies on rats and other animals studies. So the focus of the book is more on basic science rather than how to solve everyday problems though controlling one's diet. The final chapters to get to this and there is mixed news. It is not necessarily so easy to change one's gut microbial composition. While there is evidence that a plant-based diet can help, it turns out that switching to a vegan diet does not make a major difference to one's gut microorganisms. The positive recommendations Mayer makes are not very surprising. Avoid mass-produced prepared food, avoid meat and dairy that has been raised with a lot of chemical intervention, and avoid eating large amounts of animal fat. The most surprising suggestions are that the occasional fast may actually do some good and it can help to eat fermented foods like kimchi and kombucha. He also says that probiotic yoghurt can be helpful. It's hard to know how seriously to take his recommendations, since other news reports in recent years have reported that fasting and probiotic yoghurt have no significant effect on health, and that even organic produce is no better for health than non-organic. It does not seem that we are yet at a stage where we can be sure about the specific beneficial mental health recommendations based on diet beyond those that aim for good general health. But we can hope in the future to get much more specific interventions into the mind-gut system that will really help us.